Up to 10 piece Latin band featuring congas, coro, piano, drum, bongos, campana, bass, saxophone, flute, trombone, trumpet and vocals and playing a hot mix of funk, soul, salsa and jazz. Smaller line-ups also available and the band has a Latin funk offshoot - Bugalu. Up to 10 piece Latin band featuring congas, coro, piano, drum, bongos, campana, bass, saxophone, flute, trombone, trumpet and vocals and playing a hot mix of funk, soul, salsa and jazz. Smaller line-ups also available and the band has a Latin funk offshoot – Bugalu. Let’s get straight to the point – Casa Latina Allstars are one of the UK’s best and most adventurous salsa/Latino bands. Formed in 1996, they have played almost every Latin and jazz venue in Britain, including all the major festivals. Whether it’s a saturday night sell-out at London’s premier venue, The Jazz Cafe, or performing to 30,000 revellers at the 1997 Hogmany Festival in Edinburgh, they rock the house. 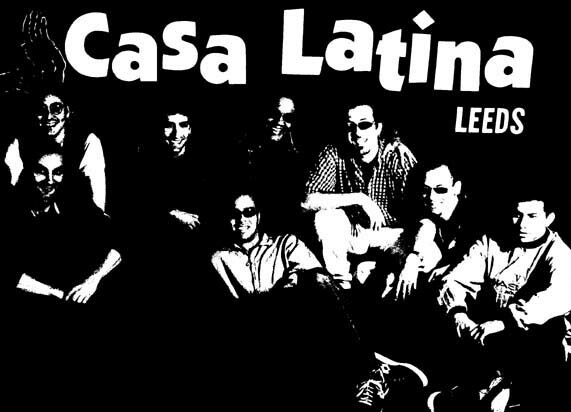 The band evolved from the extremely fertile Latino scene based around Casa Latina, the UK’s “numero uno” live Latin club in Leeds (200 miles north of London). The Casa Latina Allstars were formed from Orquestra Pa’lante, firstly as a monthly resident ‘descarga’ band, and then as the house band for backing visiting musicians. One minute they’d be with Pucho and Eddie Pazant of Latin Soul Brothers fame, the next they’d be backing Cuban Pichi Valdes, former Dan Den / Orquesta Reve vocalist. In late 1996, the original five (Sam Bell, Susana Montero, David Munoz, Geoff Winkless and Brian Hagreaves) were joined by jazz/reggae trombonist Simon Pugsley, trumpeter Bryan Davis (‘bad bwoy’ from the NYJO) and ‘Wildman’ Tony Burkhill on tenor saxophone. The line-up was completed with the arrival of the permanent bassist, Neil Fairclough, whose first love was soul and funk. No longer just a backing band/jam session vehicle – they were now a fully rehearsed and regular unit. The gigs began rolling in. Final icing on a very tasty cake arrived in April 1997 in the form of Cuban violinist Omar Puente. Although still only in his mid 30s, he was a veteran of the National Symphony Orchestra de Cuba, as well as having played with Cuban greats such as Gonzalo Rubacalba, Ruben Gonzalez, Charanga Habanera and Orquesta Reve. For the rest of that year, the band moved onwards and upwards, supporting such salsa legends as Tito Puente and Cuba’s top vocalist Issac Delgado, as well as opening for Brasilian jazz diva Tania Maria. As the year ended, they released two tracks on the Avid Records CD ‘Everybody Salsa’ and completed a very successful UK tour. !!! New Act: Conjunto Salsonito !!! Conjunto Salsonito was put together in summer 2008 by UK salsa trombonist Jonny Enright (Grupo X/ La Clave / Alex Wilson) and UK salsa DJ Lubi Jovanovic (Fania Records) to play classic salsa music for dancers. Too many UK bands were playing either too fast, too long or too jazzy. Salsonito was concieved to play salsa songs for dancing – snappy five minute arrangements, medium tempos, plenty of swing and solos limited to one instrument per number. Based in the north of England, Salsonito have chosen to go back to the classics for their sound and style, playing the trombone style of bands such as Eddie Palmieri’s La Perfecta, Mon Rivera, Willie Colon and Joe Bataan. Their salsa is 1960s and 1970s New York Puerto Rican but with a large dose of Cuban son mixed into it. They augment their salsa, son and guaguancos with mambo, latin jazz, cha cha cha and bugalu! The band is an allstar line-up of the UK’s finest salsa and Latin musicians. Band leader is trombonist Jonny Enright from Grupo X and La Clave. He’s backed many Latin music legends, from Joe Bataan to Jimmy Bosch, Bobby Matos to Tito Allen. Pianist is one-time London resident Mark Donlon, who played the keys for La Clave before moving to Leeds College Of Music to become a lecturer. Bassist is Matt Owens, the timbales player Rick Weedon, the conga player is Sam Bell, ex-bandleader of the Casa Latina Allstars, second trombonist is the up and coming Extra Love member, Richard Wassall, and lead singer is Gilberto “Kiki” Sire from Matanzas, Cuba. At last, the perfect UK salsa dancers’ band has finally arrived!